ZoeAnne: Real Techniques Nic's Picks Review. Real Techniques Nic's Picks Review. Real Techniques Nic's Picks Full review. Most people have heard of the Pixiwoo sisters Sam Chapman and Nic Haste (Chapman) who are the brains and beauty behind the Real Techniques beauty brand. The brand ranges from their amazing quality brushes and eyeshadow sets. 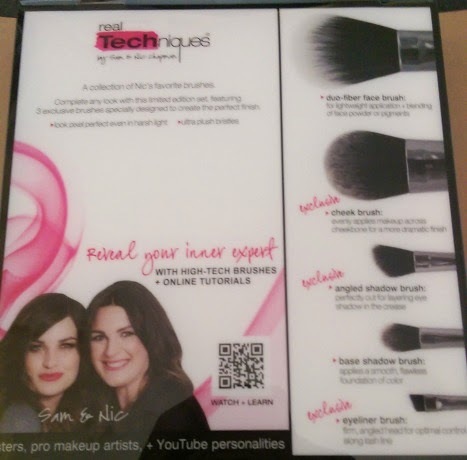 Real Techniques Have came out with the amazing Nic's pics brush set which is limited edition and is available from Boots and Superdrug on 1st October. 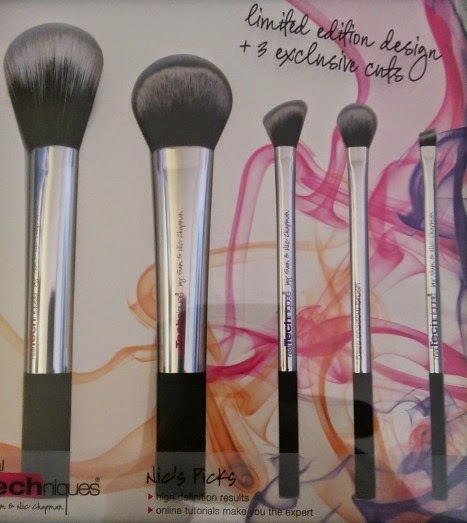 The set includes 5 brushes 3 of which are exclusive to this set. The full price for this set is £30 which is a brilliant price for the brush set, so each brush works out at £6. This brush is perfect for applying powder foundation especially loose powder. The brush gives an even amount of powder all over the face so there is no need to worry about having that powder layer on the face and the powder wont make your foundation cake either. This brush is perfect for contouring the face it applies the right amount of colour under the cheek bones and is also really good for buffing/ blending so there wont be that line of contour. The brush can also be used to apply brush or highlight but I prefer to use it for contour. Angled Shadow Brush, Set Exclusive. This brush is perfect for applying shadow to the outer V and is also very good for blending eye shadow in the crease. this is a very multi purpose eye shadow brush as you can use it in so many ways to apply eye shadow. This is another multi purpose brush when it comes to applying eye shadow, I love to use this to apply eye shadow and then blend it out as its really good for blending eye shadow in the crease out. This brush is perfect for applying gel eyeliner, as the brush is very thin and stiff so you can get that perfect line with out being all over the place and the brush allows eye liner to get right on the lash line. I think the Nic's pics brush set is another amazing set that Real Techniques have come up with all their brushes are amazing quality and wash well and keep their shape totally worth the money I am reconsidering buying this brush set so I have two of every brush. Once they are available in stores I really think you should go out and buy them.